As the online market for automobiles continues to grow, Droom is leaving no stone unturned to woobuyers. India’s first marketplace to buy and sell new or used automobiles online, droom.in is making news again after the launch of it fully transactional website. We have introduced an all new selling format on our website called “Droom Auction”. Using this format, buyers can make a bid for their favorite price to buy cars, motorcycles, scooters or bicycles. Company provides the minimum bid per the product and only registered users can participate in these auctions and bid as much they choose to. 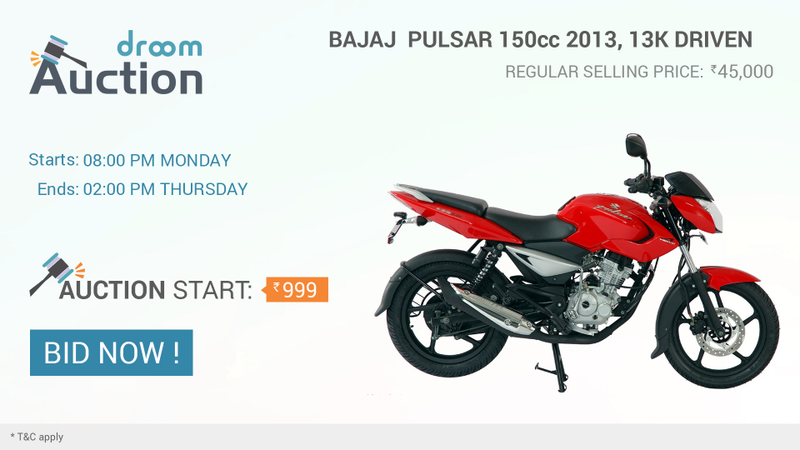 What’s more interesting is that at droom.in you can now bid to buy a Bajaj Pulsar 150cc. Regular Selling price for 2013 Bajaj Pulsar 150cc is ₹45000, and here you may get it for ₹999 (starting bid value). Simply register yourself at droom.in and start biding. This feature is available on the website only. You can make as many bids as you want for any price you love. This sparkling red color used motorcycle offers endless comfort and style. Count on it to go from home to office to market or on a road trip. This sturdy and stylish bike is sure to help you seek some attention. This auction is open till 26/02 only, so bid now. Apart from this you can take advantage of droom comes true campaign to fetch handsome discounts. Droom is the only fully transactional platform available for the online automobiles seekers. So, make your way to droom.in and start biding to buy motorcycle, car, or more. Hurry Up! Droom Benefits For Professional Automobile Sellers! Thanks – Enjoyed this blog post, is there any way I can get an email when you write a new article? I consider something really interesting about your site so I saved to favorites.